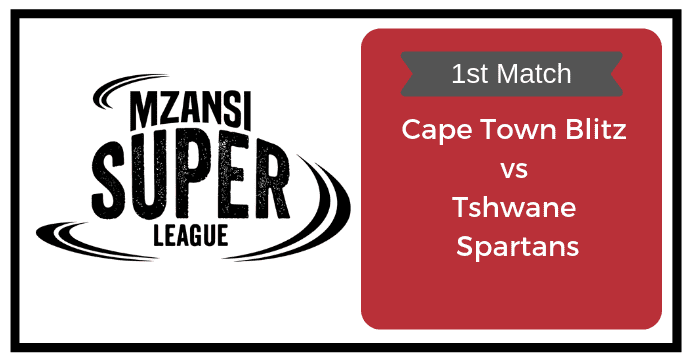 Today Match Prediction of Cape Town Blitz vs Tshwane Spartans, 1st T20 Preview, Playing 11, Injury Updates, News and Dream11 Prediction. International superstar AB de Villiers is back and will play for Tshwane Spartans. The 360-Degree player will be in action today. The competitive juices are flowing again within the teams. Can ABD start the campaign with a blast? It’s been a long time that he played on the South African soil. If you are looking for CTB vs TST Dream11 Prediction then you are are the right place. Cape Town Blitz is all set to take on Tshwane Spartans on Friday, November 16, 2018, at Newlands, Cape Town. Do you want to know Who Will Win? Then you are in the right place. In Today’s Dream11 Fantasy Cricket Match of CTB vs TST, we will cover Pitch Report of Newlands, Cape Town, Predicted Playing 11, Toss Prediction, and Fantasy Cricket News and Tips. You May like to Read EN-W vs SA-W Dream11 Prediction. Who Will Win the Match Between CTB vs TST and Toss Prediction? The return of AB de Villiers has strengthened the Tshwane Spartans Team. Although ABD will play after a long time, his hunger for the game can make the opposition to take a back step. AB de Villiers has a huge following around the world and these fans will back TST. The batting department is packed with aggressive players who can blast with the bat on any given day. Rory Kleinveldt, Robbie Frylinck, Rilee Rossouw, Theunis de Bruyn and Eoin Morgan are the players who will play today and all of them have a strike rate of almost 125 and above. You can consider the above players in your Dream11 Fantasy Cricket Teams. On the other hand, Cape Town Blitz will mostly rely on their bowlers. The team will be lead by Farhaan Behardien. Dawid Malan will be a key player of CTB in the first match. Some of the international players will be missing the first match. You can read the details below. Anrich Nortje will be a player to watch. Australia vs South Africa T20I is scheduled ahead so a lot of players will miss the first match. To know the perfect lineup read below. You can also find players injury updates and the latest news of both the teams. Dawid Malan, Anrich Nortje, Mohammad Nawaz, Sibonelo Makhanya, George Linde and Samuel Badree are the key players of Cape Town Blitz. Dawid Malan will lead the CTB team as Farhaan Behardien is with the RSA team. Farhaan Behardein, Dale Steyn, Quinton de Kock, and Andile Phehlukwayo will not play as they are on national duty. Asif Ali will also not play as he is playing T10 in Abu Dhabi. Dawid Malan, Janneman Malan and Sibonelo Makhanya will lead the batting department. Dane Piedt, Anrich Nortje and Samuel Badree will lead the bowling department. Dawid Malan is the most valuable player of CTB. Batsmen: Dawid Malan, Janneman Malan, Sibonelo Makhanya. All-Rounders: Jason Smith, George Linde, Frisco Adams. Bowlers: Anrich Nortje, Samuel Badree, Dane Piedt, Mohammad Nawaz. Jason Smith, Janneman Malan, Dawid Malan, Kyle Verreynne, George Linde, Mohammad Nawaz, Ferisco Adams, Hussain Talat, Sibonelo Makhanya, Malusi Siboto, Dane Piedt, Anrich Nortje. AB de Villiers, Eoin Morgan, Rille Rossouw, Robbie Frylinck, Theunis de Bruyn, Andrew Birch and Rory Kleinveldt are the key players of Tshwane Spartans Team. AB de Villiers will lead the TST Team. Sikander Raza, Sean Williams and Lungi Ngidi will not play the first match as they are with their respective teams on a national duty. Rille Rossouw, Eoin Morgan and AB de Villiers will lead the batting department. Rory Kleinveldt, Shaun von Berg, and Andrew Birch will lead the bowling department. AB de Villiers is the most valuable player of TST. Batsmen: Eoin Morgan, Dean Elgar, Rille Rossouw, Theunis de Bruyn, AB de Villiers. All Rounders: Robbie Frylinck, Jeevan Mendis. Bowlers: Rory Kleinveldt, Shaun von Berg, Andrew Birch. AB de Villiers, Rory Kleinveldt, Dean Elgar, Lutho Sipamla, Andrew Birch, Tony de Zorzi, Shaun von Berg, Jeevan Mendis, Eldred Hawken, Theunis de Bruyn, Eoin Morgan, Ben Duckett, Robbie Frylinck, Gihahn Cloete. Tshwane Spartans (TS) have won their warm-up game against Jozi Stars. ABD has displayed his presence by scoring 93 runs. On the other hand, Cape Town Blitz (CTB)lost their warm-up match against Paarl Rocks. According to crix11 astrology prediction, TST will win the match today. TST will win the toss and ask CTB to bat first. The match will be played on the 16th November of 2018 (Friday). Match Mzansi Super League 2018, CTB vs TS, 1st Match. Time 05:00 PM GMT, 10:30 PM, 07:00 PM LOCAL. The Pitch of Cape Town, Newlands Stadium will be a batting-friendly and it will also favour the seamers. The wicket will have a good bounce which can go either way. The fast bowlers and the batsmen can take the advantage of the bounce. Dream11 Fantasy Cricket Tips: Try to take seamers and top-order batsmen in your teams. The weather is predicted to be partly cloudy and mostly cloudy. It will remain the same throughout the day and there is no sign of rain. The temperature is expected to be 19-Degree Celsius and the humidity to be 66%, which may go up to 82%. Fantasy Cricket Expert Tips: The weather condition will favour the seam bowlers especially in the initial couple of overs. This is it for Today’s CTB vs TST Dream11 Team Prediction of 1st T20 of Mzansi Super League 2018. Read the complete post and win in any fantasy cricket league. Leave a comment below and share the post so that others can also find Crix11 which is the best fantasy cricket prediction site. Don’t forget all the information on this website is absolutely free and if you utilize the data correctly your winning chances is 100% sure.